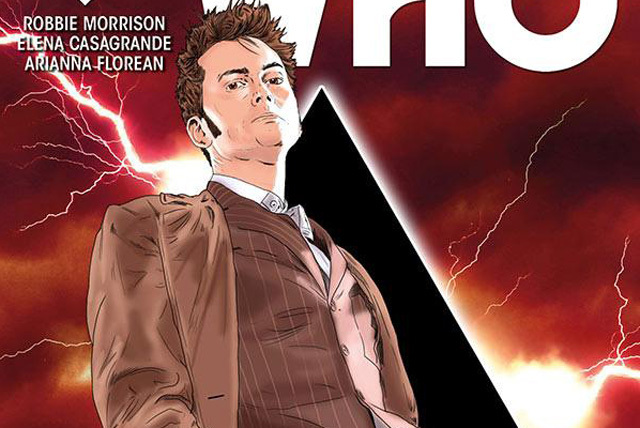 Titan Comics - DOCTOR WHO: THE TENTH DOCTOR #11 Review | Warped Factor - Words in the Key of Geek. Tony Fyler’s still young at heart. There’s a sense in which part one of The Fountains of Forever feels like it takes a long while to really get going. It deals mostly with two story-strands – the Tenth Doctor going to an auction of alien artefacts in New York, and his comic-book companion, Gabby Gonzalez, dealing with the consequences of having been away with him. Whereas with the Ninth Doctor, Rose got back a year late and the consequences were a mother who was furious and a boyfriend who’d been questioned with extreme prejudice by the police in the case of her possible murder, Gabby has it relatively easy, her consequences amounting to a best friend pulling a bit of a moody. Nevertheless, bringing her mate Cindy up to speed with Weeping Angels, Cerebrovores and the like takes up a significant chunk of panel-space here, to the extent that you begin to wonder what the point of it all is. Oddly enough, you wouldn’t wonder that if this was done on TV, it would be the equivalent of the scene in The Sontaran Stratagem where Donna Noble tells her grandfather all about the adventures she’s been having – a moment of calm before the storm begins all over again, and a deepening of the companion’s character by virtue of a window on their real lives when they’re not travelling with the Doctor, the people who make their life what it is, and make them who they are. Nevertheless, in two dimensions it has a tendency to drag just a little, Cindy’s reaction veering from ‘No way is this real’ to ‘This would make a great graphic novel’ – a nice tongue in cheek moment, given the medium through which it comes to us. Meanwhile the Doctor’s after a very particular lot at the alien auction, and after chuckling and pouring scorn on some of the other exhibits – including a few from the Van Staten vault – it emerges that the item he’s interested in has already been bought, privately, by someone or something else. Along the way to that discovery he’s accosted by a woman who knows a lot about alien tech and who wants to be called Cleo. Hunting down the mystery object together, things get more and more out of control for this pair, leading to the kind of cliff-hanger you get to pull once in a lifetime, if you’re very very lucky, and extremely talented. That’s the point about this issue: there’s a degree of filler and emotional backstory, there’s some catching up with Gabby’s life and friends and a bringing forward of her bestie into the world of Who, but ultimately, whatever the rest of the issue was like, you’d have to go and buy this one – I mean absolutely have to – for that final panel. That panel that hits it not only out of the park but off the planet and into the vortex and back ten years in terms of excitement. Nick Abadzis does something here that’s so audacious you really hope it gets to stay in place for some of the next issue, if only to confuse the bejeesus out of your issue numbering system and drive the OCD comic collector up the freakin’ wall. Elena Casagrande, delivering really crisp panels of artwork in this issue, comes closer than most other artists when it comes to delivering a credible David Tennant, and her rendering of that final panel too is the sort of thing to make you wish you could zip ahead, Tardis style, to the next issue, to see what happens. You remember that cliff-hanger from the end of The Stolen Earth? That’s not what happens here – if anything, it’s better – but you remember that sense of ‘Holy Hannah – now what?’ as the TO BE CONTINUED slammed up on screen, and you genuinely had to wait a week to find out what would happen next, and it felt like being a kid all over again, because you didn’t know too much already and you wondered what they’d planned? That’s the league we’re in here. That’s a pretty big league – it’s necessarily going to dwarf much of what leads up to it, just as The Stolen Earth’s cliff-hanger did in its day. So what are we saying? Most of this issue’s just OK, but the ending rocks your world? Well, pretty much, but that’s just the overall flavour. The story-thread with the Doctor and the artefact is engaging enough, particularly as it centres on the mystery of Cleo and her knowledge about all kinds of alien techno-gubbins. The scenes with Gabby catching up with Cindy are slow by comparison, but, as with that Donna Noble going home scene, there’s a sense of a storm coming, so it’s just as well to get the ‘best friend’ scenes out of the way now, in case there’s not time or breath later. But the issue concludes on a real high note to make you run around like a headless chicken till next time, so yes, you absolutely have to get this one – if not for the final panel, then at least for the sense of a big, exciting storyline being just about to break, and the need to be prepared, to know who’s who and what’s what and where all the players are before the ensuing mayhem begins. 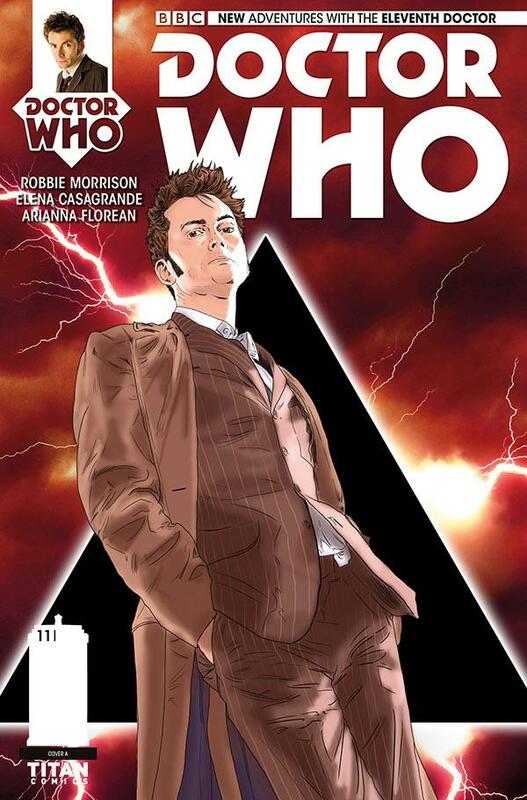 Doctor Who: The Tenth Doctor #11 is released Wednesday June 10th. Check out an advance art preview here.